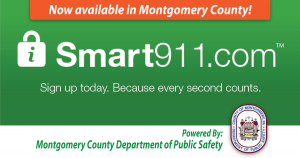 Norristown, PA (Sept. 22, 2017) – Montgomery County Commissioners introduced a new emergency preparedness program at their meeting Thursday that residents can use to submit a safety profile to the Department of Public Safety for use in an emergency. Smart911 is a free service that residents can use to provide information they want first responders to have in the event of an emergency. Users register for the service at www.smart911.com and fill out a questionnaire, providing as much or as little information as they want. Then, if a 911 call is received from the phone number associated with the profile, that information will automatically be displayed to the call taker. People can identify members of their household and include a description and upload a recent photo, which would be helpful if a family member goes missing. The photo and description can immediately be forwarded to police officers in the field and help expedite a search. If there is a fire, knowing how many people and pets live at a location, and whether any of them might have mobility issues or medical concerns, can help fire fighters conduct a search and bring everyone to safety. When someone creates a Smart911 profile, the information is stored on a private and secure national database and is only accessible when a 911 call triggers it. Additional information such as pets in the home, vehicle details in the event of an accident, and emergency contacts can all be included in a safety profile. Smart911 also benefits Montgomery County’s Text-to-911 service. If someone using that service has created a safety profile, much of the information needed to respond will already be available to the call taker. Plenty of Easter flowers for sale from Norristown Fire Companies this week. Stop by the Fairmount on Thursday and Friday, and the Hancock on Friday and Saturday. Once again, Norristown Firefighters had the great opportunity to attend a week long International training conference in Indianapolis, FDIC.